A social media group claiming to be a part of the social justice movement Black Lives Matter, but was revealed to actually be linked to a Russian propaganda apparatus, apparently tried to use Pokémon Go in its social media campaign to sow divisions among users. It wasn't very well thought out. CNN released a report today on a social media campaign called "Don't Shoot Us" which from a cursory glance appeared to be a social media group allied with social justice. However, CNN linked the group to the Russian-backed troll organization known as the Internet Research Agency, which creates fake posts on social media services like Facebook and Twitter to enflame the United States' already fraught civil divisions. CNN seemed to suggest that the Russian troll farm was using Pokémon Go as a platform for its propaganda campaign. However the actual details paint a more crass, and less-sophisticated picture. The details go like this: CNN uncovered the propaganda organization's website, donotshoot.us, which linked to an affiliated Tumblr page. On July 2016, the Tumblr page held a social media contest using the game Pokemon Go. The contest was completely separate from, and held without the consent of, Pokemon Go developer Niantic. The contest asked users to go to locations where police brutality have taken place, capture Pokemon from that location, and name their captured Pokemon after prominent figures in the Black Lives Matter movement. 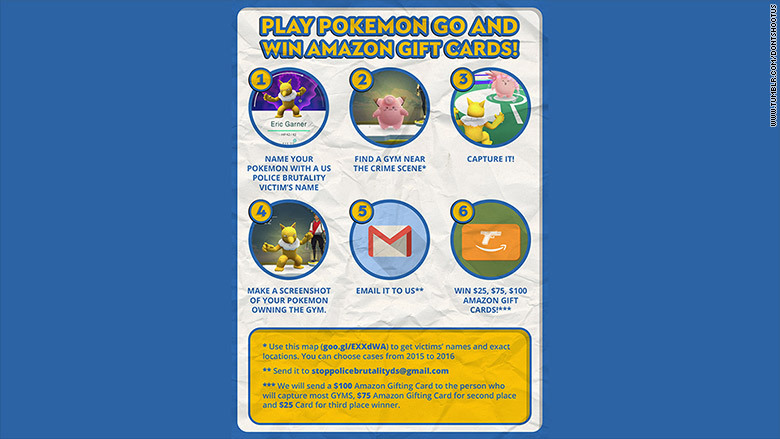 The winner who emailed a picture of the winning Pokemon would receive a $100 Amazon gift card. Not only is this incredibly offensive, but the contest appears to be an attempt at purposefully trying to create divisions and also attempting to link Pokémon Go to social justice movements. It should be noted that, for some reason, the Russian government seems to detest Pokémon Go. Niantic issued a response to CNN for its investigation saying, "It's clear from the images shared with us by CNN that our game assets were appropriated and misused in promotions by third parties without our permission." Niantic also reiterated that Pokémon Go as a game can't directly be used as a platform to share information (or in this case, misinformation), and that the fake contest didn't directly take place within the game itself. Earlier this year, a Russian YouTuber who filmed himself playing Pokémon Go in a church was convicted for "inciting religious hatred," and was given a three-and-a-half year suspended sentence. Meanwhile talk shows in Russia ran stories that implied Pokémon Go was some kind of mind-control service. Some pundits suggest the Russian government is fearful of Pokemon Go's ability to generate crowds in public, but for whatever reason apparently Pokémon Go is bad in Russia. This could explain why Pokémon Go was used in this particular instance of Russian propaganda. Tagged with Android Devices,	ios,	mobile,	News,	Niantic,	Pokemon.